MAPUSA: Cunchelim Sports Club registered a comfortable 3-1 win over Saligao Sporting Club in the GFA’s 2nd Division League match played at Duler Stadium, here, on Wednesday. Cunchelim started on the front foot and in the 10th minute after Ganesh Poojar got hold of a pass from Vayan Virnodkar he let go of a firm grounder which hit the head of the advancing Saligao keeper Abinay. Minutes later, Cunchelim's Mahableshwar Thaneka’s fierce shot which was travelling into the net was well kept out by keeper Abinay and the ball came to Santosh Parwar who surprisingly blasted the ball wide. Saligao who were kept quiet for most of the first half had two back-to-back chances of taking the lead first Aloke Bolekar long range shot was acrobatically parried out for a corner by keeper Siraj and then in the 25th minute Ajay Diwadkar’s well directed header from a cross by Chandan hit the crossbar. Cunchelim finally found the net in the 32nd minute through Mahableshwar who finished clinically after being teed up by Vayan Virnodkar. Crossing over the ball was mostly confined to the midfield but in the 71st minute Rohan Kamble played a neat pass to Ganesh who slotted the ball into the net. 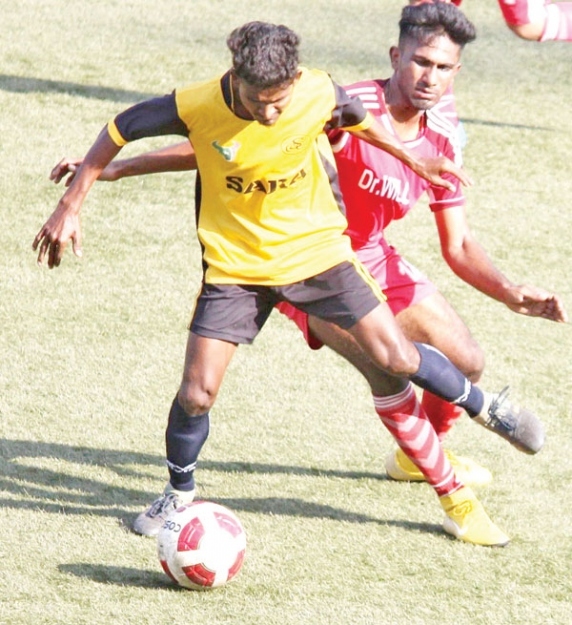 Saligao set up a tense finish when they managed to pull one back in the 76th minute when Ajay Diwadkar got hold of a pass from Nelson Nunes who intelligently lobbed the ball over the Cunchelim keeper Siraj to make it 2-1. With Saligao pushing more men forward in search of the equaliser they were caught napping at the back who were punished by Ganesh Poojar who finished with a neat placement to make it 3-1 and give full three points to Cunchelim. At Poriat ground, Milagres Sports Club tasted their first defeat after having won their last five matches. They went down by a 1-2 margin to Assonora United Sports Club. Albino Pereira gave Milagres the lead in the 35th minute, while Dikshay Sarap levelled terms for Assonara United in the 37th minute. On crossing over in the 66th minute, Brijesh Kankonkar scored to give full points for his team by making it 2-1. In another match played at Ambelim ground, Aulon Gomes scored the only goal of the match in the 41st minute as Mandopa Sports Club beat SWC Zaino 1-0.